Pas besoin de logiciel pour çà , juste les oreilles. My name is Ton, and owner of Radio Condor. My location is in the Netherlands,about 25 km s/w of Amsterdam. The music I like is trance,techno and Italo Disco. 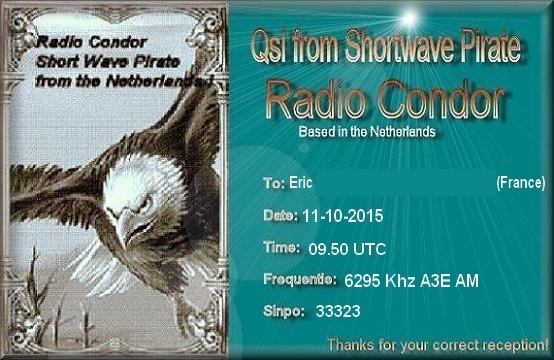 So it is very simple to RECOGNIZE my station on shortwave. (I don`t want be troubles with my neighbours)!!! The antenne I used is a inverted v with a balun. The top is about 13 meters. My best regards,and till next time!